When it comes to everyday carry systems there seems to be many schools of thought or understanding. Either way it doesn’t take a rocket scientist to figure out what items of gear that you use on a daily basis or will need in case of an emergency. The everyday carry or EDC bag is the second layer or tier of an EDC system. This bag may not be on you at all times but should carry what you can’t or shouldn’t pack in your pockets. It should include the essentials and be accessible in a moment’s notice. IT IS NOT A SURVIVAL BAG OR BUG OUT BAG! I see other preparedness bloggers and even preppers mention that the EDC bag and bug out bag are the same thing. THAT IS REDUNKALOUS! That couldn’t be the furthest from the truth. For example, one person may have a laptop in their EDC bag. You obviously don’t need that in a bug out bag. 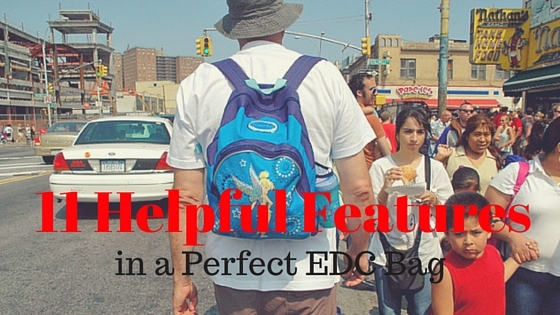 However, the EDC bag should be functional and contain certain features to meet your everyday use. It should be built to make your life easier and help you to be better prepared for what the day may bring. In my quest for searching for the perfect EDC bag I’ve identified 11 features that the perfect EDC bag should have. The most important element of an EDC bag is that it doesn’t have “tacticool” characteristics. I know that preppers love their molle webbing and molon labe patches. But this can cause alert and suspicion to others. For example, co-workers who may not be pro-gun may not like your second amendment patches or tactical look. This is all the reason that would be needed for them to alert managers or others which may in turn have your belongings checked. Even if there are no specific company policies against carrying or even if you aren’t carrying you don’t want to be a subject of this suspicion. The problem with some EDC bags is that you have to grab and hold them in your hand while moving around. This isn’t always convenient especially if you are already carrying multiple items in your hands. My recommendation is that you use a sling pack so that you can easily throw it over your shoulder. Another great benefit of having a sling pack is that you can quickly throw it over your shoulder if you ever have to bug out or move out really quickly. Unlike a backpack you would need to stop in order to pull the bag on your back. You can also pull the back around to your chest so that you can quickly grab items. Organization goes hand in hand with preparedness. You cannot be adequately prepared if you are not organized. If your bag is full of clutter you will not be able to quickly access urgent or frequently used items. You would spend more time digging around in your bag. A bonus to have in a bag is hidden compartments. This is especially true if you have a conceal carry weapon in your bag. You don’t want others to have quick access or to even know that you are carrying. Other possible items that you might want to keep hidden would be sensitive, private items such as credit cards, money or identification. That way if someone is digging around in your bag while it is unattended your information will be safe. There are few bags on the market that have some really great reviews that have these hidden compartments. Such bags include the Tactical Tailor bag, Condor Agent Covert Sling Pack and Pacsafe Venturesafe 325 GII. Unfortunately I haven’t been able to purchase these items to review but have received great reviews online. Being that this bag is an everyday pack there is a chance that you will be wearing this bag on a day that it is raining. You may have electronics or paper documents packed. So I would highly recommend purchasing a bag that is water resistant such as the Under Armour Compel Sling. Now there won’t be any bag that is totally 100% water proof however being water resistant will buy you some time to find dry shelter from the rain. You may have seen thieves come behind others to either grab their bag or quickly cut their straps so that they can take off with them. Thieves don’t want to spend time struggling with a victim because that would lead to a better chance of them being caught or identified. So having strong material on the straps would help from being easily cut. Wearing a sling bag will hinder the thief from quickly taking it off of your shoulder. When you are walking a long distance it can be painful to have items poking into your back while wearing a bag. You also don’t want to have a strap choking your throat as the weight drags down in your bag. That is why you need to have padded straps along with the backside of your bag. I’ve noticed with some sling bags and even backpacks that they tend to sag as the pack becomes heavier. This can make your commute uncomfortable and can even hinder your productivity. Along with that it can affect your preparedness if you are frequently stopping to readjust your bag. The last thing that you want in an emergency is having your necking being burned from the strap of your bag or being covered in your own sweat that has built up on your bag. You will want a pack whose back padding moves heat and doesn’t allow moisture to build up. With an EDC bag you don’t want to buy a cheap bag that will rip or is easy for holes to punch into. Because this will always tend to happen at the very moment that you can’t afford it to. I would shy away from cheap nylon bags. If you do purchase something that is nylon makes sure it is from a reputable brand. In most of our EDC bags we likely have either sensitive items or items that you don’t want others to get a hold of. For example, if you have your conceal carry in your EDC bag you don’t want others to have access to that if it is unattended for a certain time. For these circumstances you will want to have 2 zippers to that compartment with loops that you can insert a small lock. This should be a combination lock as they’re harder to crack. I mentioned a few suggestions earlier but I would highly recommend the Under Armour Compel Sling Pack. I have been highly impressed with Under Armour products. The bag meets most of my suggestions above. It is more in my price range but plan to buy a more expensive option such as the Tactical Tailor bag in the future. It just wasn’t in my budget at the time. Altogether these 11 features would be what I highly recommend in an EDC bag. Feel free to leave a comment below if you have any additional suggestions or questions. Your feedback helps the prepper community to prepare the smart way now that we can thrive later.